In December, scientists announced that NASA's Voyager 1 spacecraft has encountered a strange, new realm at the far outer reaches of the solar system. 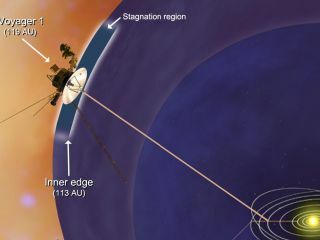 Voyager 1 is knocking on the door of interstellar space, more than 11.3 billion miles (18.2 billion kilometers) from Earth. The new discovery showed that the probe has not yet exited the solar system, though researchers think this momentous event should happen relatively soon. Voyager 1 is the farthest-flung manmade object in the solar system. The probe and its twin, Voyager 2, launched in 1977 to study the giant planets Saturn, Jupiter, Uranus and Neptune. After conducting this "grand tour," the spacecraft kept flying, streaking through unstudied realms on the way to interstellar space. Voyager project scientist Ed Stone discusses NASA's Voyager mission in April 2011 at the agency's headquarters in Washington, D.C.
SPACE.com: So these latest results are something of a curveball. It seemed like Voyager 1 was getting close to leaving the solar system, and now you find out there's yet another layer to cross. Were you guys disappointed to learn this? Stone: Oh, no — you're never disappointed. You just try to figure it out. As a scientist, that's what you do, right? You're learning something. SPACE.com: When do you think Voyager 1 will break free into interstellar space? Stone: It's probably a couple of years. It could be sooner, obviously, but if you ask me, I would say a couple of years. SPACE.com: And what's that based on? Stone: Just based on the scale, the size of things out there. We move 3.6 AU [astronomical units — the distance from Earth to the sun, or about 93 million miles (150 million kilometers)] per year, so a couple of years is like 6 to 10 AU; that's the scale on which one might expect this to happen. It's just an intuitive scale idea. For it to happen in a couple of months, that's only a few tenths of an AU — that's hard to imagine. But that's not science — that's just saying scaling sort of suggests that. SPACE.com: What will it mean when it finally happens? Stone: I think it's a major milestone, that we've actually got a spacecraft in interstellar space for the first time. Scientifically, I think that's important, but also non-scientifically — the idea that we have left the heliosphere, we have left the solar bubble and entered interstellar space. SPACE.com: What are some of your favorite moments from the Voyager mission? Stone: It's a long list — just time after time, you go wow! I like to bookend it, because otherwise it's impossible. One bookend is the volcanoes on Io. Before Voyager, the only known active volcanoes in the solar system were here on Earth. Then you find a moon of Jupiter is 10 times more volcanic. How can you not be surprised? It just changes what I call this sort of terracentric view. Oceans? Well, we think there's one on [the Jupiter moon] Europa now. But the last bookend was Triton. It's a captured moon of Neptune; it's 38 degrees above absolute zero, Kelvin, yet it has geysers erupting from an icy polar cap. That's a bookend. Pretty crazy. You start with volcanoes, you end with geysers at 38 degrees above absolute zero. So I just bookend it. But there are many things in between. SPACE.com: Do you hope to see the Voyager mission through to the end? You've said the first instrument will probably die in 2020, and all of them will probably stop working by 2025. Stone: I hope I'm around! It's already been 40 years, but I still feel great.